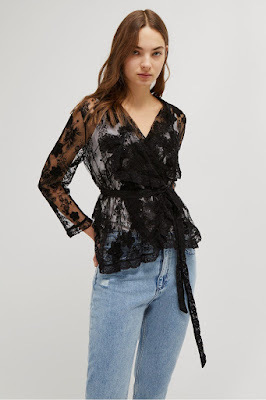 This season French Connection have added a touch of lace to some of their key pieces to give them a softer edge or add some detailing. Give your striped work shirt an uplift with this mix of cotton and lace or maybe some extra texture to your summer staple white jumper. On summer evenings, the Elayna Lace Waterfall Jacket offers the perfect light layer. Crafted from delicate lace, the jacket has an intricate design rich in detail. A flattering tie waist and waterfall front create a draped look, easy for pairing with favourite dresses on special occasions. The Cateline Devore Lace Floral Slip Dress is a sweet summer piece perfect for warmer days. 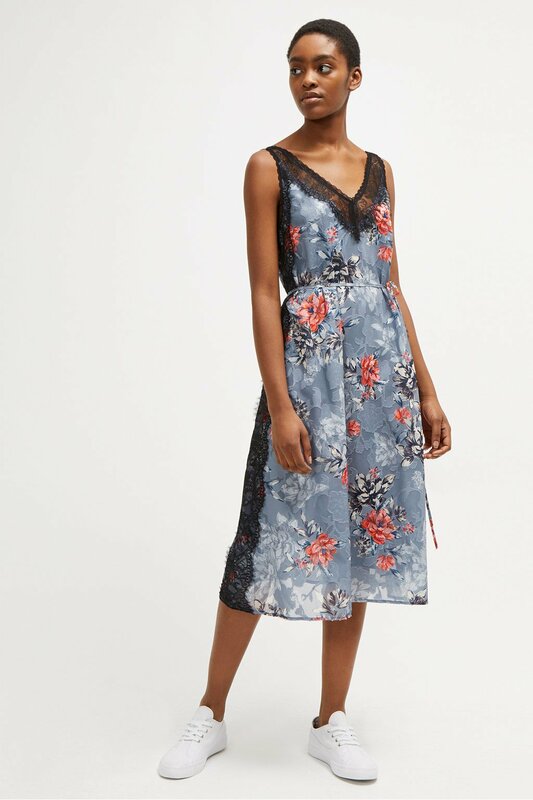 A pretty slip dress is covered in a vibrant floral print, with delicate lace inserts punctuating the design along the neckline and sides for added detail. A loose fit is cinched with a tie waist, while a V neckline and thin shoulder straps complete the flattering design. Layer under a denim jacket throughout the season. Relax on warmer days in the Marais Lace Mix Knit Dress. The sleeveless dress is knitted and takes a casual, easy silhouette. Punctuating the knitted fabric is a lace insert, visible along the hem and open sides, which are held with small ties. Paired with trainers and layered under a denim jacket, the dress is perfect for the weekend. The Ortice Lace Knit is a relaxed yet stylish jumper, perfect for casual days. Featuring a reversible v-neck which can be worn at the front or back. The casual silhouette is offset by long sleeves embellished with delicate lace inserts, for a feminine finish. Team with stylish joggers and trainers for a luxe athleisure look. Update your 9 to 5 wardrobe with the Adena Lace Mix Shirt. 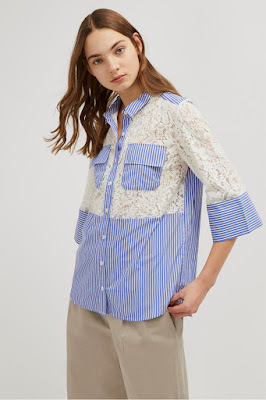 The classic cotton shirt features a bright blue and white stripe pattern punctuated by contrasting white lace across the chest and arms for added texture. The relaxed piece has a button front, cropped sleeves and a point collar, creating an easy piece for pairing with culottes or slim fit trousers for work. 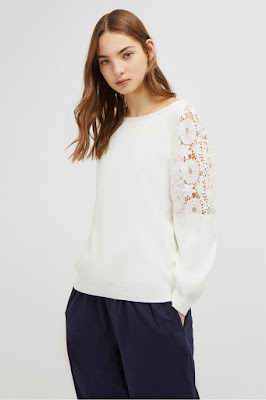 A relaxed, long-sleeved jumper is finished with dainty lace for a pretty twist on casual wear. Crafted from pure cotton, the Caballo Lace Knit Jumper has a super soft, cosy feel. Delicate lace with a sheer finish runs from the elbow down the sleeve, tied with a ribbon at the wrist for an eye-catching finish. The v-neck knit has a form-skimming shape, perfect for pairing with relaxed-fit denim. Making a case for statement knitwear is the Patchwork Mozart High Neck Jumper. 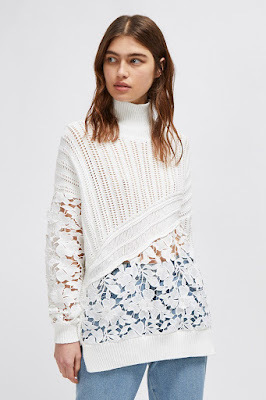 The cotton jumper features a patchwork design where pretty lace combines with a laddered knit finish for an eye-catching result. 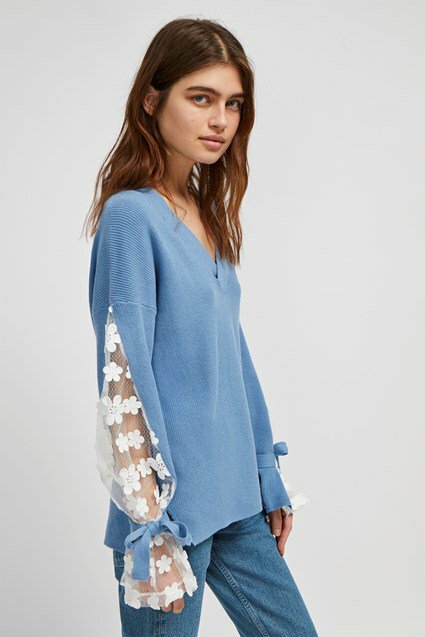 With long sleeves, a high ribbed neck and a loose fit, the jumper will bring a cosiness to your favourite denim.